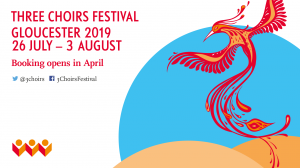 The celebrated Three Choirs Festival has revealed its full programme for this year’s festival, which takes place in and around Gloucester from 26 July – 3 August 2019. The spectacular large-scale choral concerts at the heart of the festival are complemented by a wide range of chamber recitals, talks, exhibitions and family events. Full details are available from 3choirs.org, with tickets on sale from April. The 150th anniversary of the death of the Romantic visionary Hector Berlioz was one of the very first milestones to shape this year’s programme, and signals the start of the cathedral concert programme in dramatic fashion with the composer’s fantastically inventive The Damnation of Faust (27 July). Spirited cellist Natalie Clein joins the BBC National Orchestra of Wales for a centenary performance of Elgar’s contemplative Cello Concerto, alongside Berlioz’s Le Carnaval Romain and An English Requiem by John Joubert, who died earlier this year (30 July), and Martyn Brabbins conducts the Philharmonia in an evening of orchestral fireworks including Berlioz’s touching Les nuits d’été (1 August). Cheltenham-born Gustav Holst’s interest in Indian culture was the catalyst for an exploration of a rich seam of Anglo-Indian connections that sees the festival partner with London’s Bhavan Centre and the Holst Birthplace Museum. Talks delve into Holst’s fascination with India and the Rig Veda itself (2 August), while local history buffs can learn about the county’s Anglo-Indian Connections. Dancer Shivaangee Agrawal leads a workshop and showcases her talents in Bharatanatyam dance (1 August), and leading South Indian performers present an afternoon exploring Karnatic Raga (2 August). Families can enjoy a musical retelling of the Ramayana by the Dr K Sextet and Indian Arts and Crafts (3 August), while cultures come together for a very special late-night event in which the Oriel Singers are joined by members of the Bhavan Centre to weave together Vedic chants with Holst and other composers’ own choral settings of these Hindu texts (2 August). Music by living composers has long been central to the festival, but especially this year, where each performance with young people to the fore features music of today. Large-scale performances bookend the festival, with Stephen McNeff’s ‘miracle play for music theatre’ The Burning Boy staged in Tewkesbury Abbey with a professional cast and a young chorus drawn from across Gloucestershire at the start of the week (27 July) and at its close, eighty years to the day since the last Kindertransport left Prague, local children perform Carl Davis’ poignant Last Train to Tomorrow (3 August) as the culmination of a community-wide drama, music, writing and art initiative. The Three Choirs Festival Youth Choir performs Karl Jenkins’ enduringly popular The Armed Man alongside a dramatic new piece by Giles Swayne (30 July) and the vibrant young Rodolfus Choir perform a programme of Elgar and Tavener inspired by peacefulness and serenity (29 July). Later in the week, the Three Cathedral Choirs and their full complement of choristers (girls and boys) come together to premiere Bob Chilcott’s new Christmas Oratorio alongside Britten’s Ceremony of Carols (1 August). A new solo organ piece for John Scott Whiteley (29 July) by Sir James MacMillan will mark the composer’s 60th birthday in 2019, as the festival programme showcases some of his finest works, including Seven Last Words from the Cross (sung in Tewkesbury Abbey by the Choir of Merton College, Oxford, 26 July) and four stirring works in the Broadcast Choral Evensong (31 July). Other notable premieres at the festival include Robert Saxton’s Violin Sonata for Madeleine Mitchell (28 July), a new song cycle by Ian Venables for Roderick Williams (1 August) and a choral work by Sally Lamb McCune, sung by the Oriel Singers (2 August). For further details of free ticket schemes for local and young audiences, visit 3choirs.org. The festival welcomes applications from potential volunteers, and keen singers aged 14-25 who would like to join the youth choir. Ticket Office: 01452 768928 10 am – 4 pm, Monday to Friday. A local ticket office will open in the King’s School on Monday 22 July.